For the past two and a half years, we have been building an educational program that's called “Medieval Maidens.” Current toys and children’s literature tend to focus on what boys did in medieval times and we wanted to create a program that would teach about what girls did. A princess theme was chosen to coincide with the princess craze for girls ages 7-10. Our goal is to teach young girls about what their counterparts did in medieval times and to inspire them to continue to study women in history. In the fall of 2006, Medieval Maidens introduced the first of a series of beginning chapter books about medieval princesses. The book, Gisela’s Story, is about one of the daughters of Charlemagne. The series has continued with stories about Adele, daughter of William the Conqueror, Isabelle, daughter of Louis IX, Gevrehan, daughter of Sultan Mehmed II and Mary, daughter of Henry VII and youngest sister of Henry VIII. In the fall of 2007, we began a series of books on how these girls celebrated various holidays. Medieval Maidens has sponsored educational programs for area Girl Scout troops, school groups and library reading groups where we discuss daily activities of young people in the medieval times. We have even created a Medieval Maidens Quest for the Walters Art Museum in Baltimore. 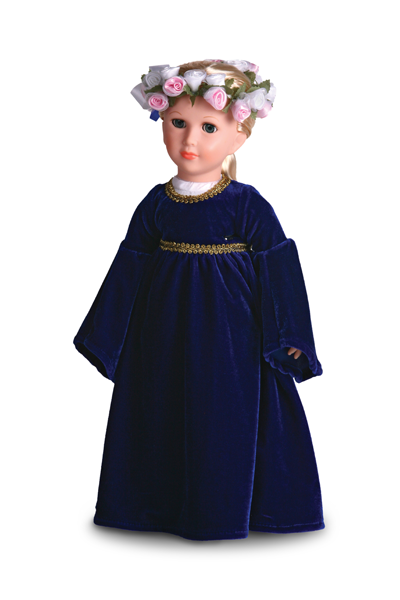 In March of 2008, we introduced the first doll in our series, an 18 inch vinyl doll. In February of this year, we set up a booth at the International Toy Fair where our maidens were greeted with much enthusiasm.